Contact Us To Find Out More On Our Specials! Modern Exteriors of Springfield is proud to be the premier source of high-quality patio covers for homeowners throughout Southwestern Missouri, Northwestern Arkansas, Southeastern Kansas and Northeastern Oklahoma. We have been a dealer of TEMO patio room systems since 1998 and proudly offer their unique patio cover products, which are some of the very best on the market today. Made from high-quality materials and boasting stylish designs, these patio covers can make lasting and beautiful additions to any home. The columns of TEMO patio covers are inspired by Italian architecture and are available in three distinct styles: the Roma, the Venetian and the Florentine. All are made from high-strength, fully extruded aluminum to ensure durability, and they are given an exceptional finish that won’t crack, peel or warp, ensuring an attractive appearance year after year. The columns support TEMO’s innovative polycarbonate thermal roof, which can create a cool, shady space for you to enjoy on even the sunniest days. If you’re worried about insects but still want to enjoy the openness of a covered patio from time to time, we also offer another innovative TEMO solution – the retractable screen room. Available in either the Santa Fe or St. Thomas style, these patio covers include full-length insect screens, which can be quickly opened or closed to provide you with protection when you need it. 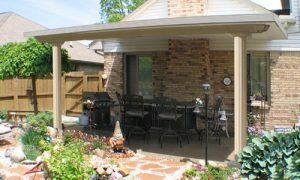 For more information on our patio covers for homes in Springfield, MO; Joplin, MO; Lebanon, MO; Pittsburg, KS and all other nearby cities, contact us today. In addition to patio covers, we also offer pergola systems, home siding, vinyl and wood windows, vinyl railings, decking, sunrooms and other home improvement products. See Our Quality Craftsmanship for Yourself! © 2019 Modern Exteriors. All rights reserved.